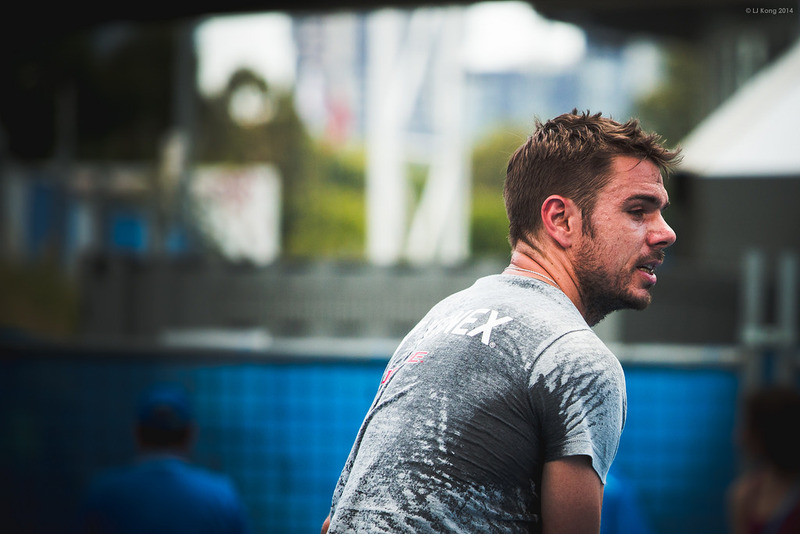 Stannis Wawrinka, the Australian Open 2014 Champion. Copyright LJ Kong, 2014. Image used with permission. The first memorable match in the women’s draw was the Ana/Serena match in Round 4. It was good to see Ana play successful low-percentage, aggressive tennis. Although Serena was off her game, Ana played with a confidence that had all but disappeared after her Roland Garros victory in 2009. She has a powerful aggressive game, and it was good to see it back in action. Wawrinka’s defeat of Nole must also be mentioned. After two heartbreaking defeats in five sets last year, this win must have felt fantastic. The match wasn’t the most high quality of their encounters, but both players continued their grand slam rivalry right where they left it—a fifth set decider. This match continued the theme of the tournament, finishing with a strange ending: two uncharacteristic errors from Nole (although, maybe we’re seeing a bit more of these errors from him in the end stages of the recent big matches that he has lost). Then there was the latest Rafa-Federer match, which, unfortunately, the less delusional of Federer fans saw coming. Nadal played brilliant tennis, and Federer played less than brilliant tennis. The result was straightforward enough. Lastly, there was schizophrenic final. In the first set, Wawrinka simply outclassed Nadal. His serves were well placed, he had a solid plan, and he executed it to perfection. He was actually dominating Nadal. A first-time slam finalist appeared to be more comfortable than the man competing for the claim of the greatest of all time. That set was followed by one of the most absurd passages of play in recent times. In the second set, Nadal tweaked his back and was reduced to serving at speeds less than 80mph. To put that into perspective, well, it’s hard to put that into perspective, but these are serves that are slower than ones you’ll find at your local tennis courts. At this point I was thinking that being the class act that he is, Nadal was just feeding the balls to Wawrinka instead of retiring to not deprive Wawrinka of his glory moment. But then in the third, Wawrinka got absolutely flustered about how to finish off the injured Nadal. He dropped his balls short, took the pace of the ball, and subsequently lost the set. By the fourth set, Nadal was recovering, and I for one, was wondering if we might see a stunning comeback just yet. But Wawrinka shook off his nerves, and wrapped up the fourth set with some steady serving at the end. I think these are the matches I’ll remember going into the tennis season. None of them were exceptional in terms of quality or drama, so most likely by the end of the year, I’ll forget most of them. The Australian Open is too early in the season to predict the players’ performances coming into the tournament. However, after the tournament, it’s nice to pause and predict what lies ahead. Despite that final’s hiccup, Wawrinka was the best player throughout the two weeks span. His serving was the best, and his groundstrokes were just clicking. Although there has been some talk about putting up an asterisk next to his victory, I don’t think that is fair. He beat the top two players in the world by largely being the better than both of them. Add to that, mentally it was an impressive feat. He was freaking 0-26 in his last 26 matches versus Nole and Rafa. In addition, he was 0-26 sets against Rafa coming into the final. To not let that bother him is impressive; it just showed the mental adjustments he made over the last year. If he can maintain his game and mentality, he might be in for a good run at Roland Garros. Of the guys with one-handed backhands, he might be the least affected by the bounce of the ball on clay. Of course, only a fool would bet against the owner of Roland Garros. So I think he just has to bide his time. The next hard court tournaments, unfortunately, are notoriously slow, so if he faces Rafa, I wouldn’t be too optimistic about it. But, he should feel pretty good about his chances at Wimbledon and the North American hard court season. If he has a reasonable shot at winning any slam this year, it’s probably the US Open, as long as he can maintain his confidence and focus– even if he finds Nadal on the other side of the net come September. Of course, if I talk about Federer, I have to talk about Nadal. And what can I say? I am, if it’s not already apparent, foremost a Federer fan. And of course, I was rooting for Federer to win. But as painful as it was to watch that, and as much as I wanted to generate some hatred towards Nadal, it’s just impossible to not be his fan as well when he plays otherworldly tennis like that. Just amazing. When you’re getting those in, your opponent doesn’t stand a chance. So all the credit to him. He was fantastic. As much as I wanted to hate Rafa, I could not. He was just too damn good. That’s why I watch tennis. For those exceptional shots. When you go, ‘how is this even possible? !’ He was doing it. It was fantastic. Unfortunately, things didn’t quite work for Rafa in the final. He was outclassed by Wawrinka in the first set, and then his body failed him. I wonder if he is ruing this missed opportunity in the grand scheme of things. I also wonder if Federer rues his chance at beating Del Potro in the 2009 US Open as well. So for now, the race for the greatest of all time gets prolonged. But Rafa is still set to overtake Federer’s slam count in 5 years time. Let’s assume he wins 1 this year, which leaves 4 in the next 4 years. Very doable. Moving on to other folks. I was hoping Juan Martin Del Potro (fun name to type) would have a deep run this year, but he disappointed. He’s had a great couple of years now, and he’s knocking at the doors of the Big Four, but he needs to push through sooner rather than later. Raonic and Dimitrov also showed signs that they should be getting to the upper echelon of the game soon. Perhaps the most exciting development from this Australian Open might be that Dimitrov is truly starting to believe that he can be in the upper echelon of the game. After all, most players don’t burst into tears after a closely fought loss against Rafael Nadal. Only men who believe they can do better do that (Except Federer. He last cried at the Australian Open 2009, but hasn’t figured out Rafa yet). But hopefully these newer players will bring something to the table to stop this hegemony of the Big Four. The women’s tournament was probably more enjoyable overall than the men’s tournament this year. The last couple of years have given us a solid consistent narrative, and this tournament, even with the drop of the top seeds, was a highlight as far as their collective performances were concerned. The top players didn’t lose because they were garbage, they got outclassed by their opponents. Then there the women’s find of the tournament, Eugenie Bouchard. She is probably going to marketed as the next Sharapova in the making (incidentally Nike sponsors them both). A semi at 19 is pretty impressive, and she sure as hell earned it. I think I was more impressed by her belief than her solid game. Before the semifinals she said, “…it’s not exactly a surprise. I always expect myself to do well. I’m just happy to have, you know, gone through this step. I’m not done.” This is the same belief that Wawrinka finally has, at 28, where he think he can beat the top guys now. Bouchard is being compared to Sharapova because of her looks, but hopefully her takeaway will be the comparison to one of the most competitive players in the tour, who happens to have won 4 slams. Though Sharapova is the bolder player, with a much more aggressive game, Bouchard has a clever, safe game with enough power behind her shots that she can beat most players. But for now, her will and composure on court will count the most. In fact, it should be a good couple of years to watch the foremost younger WTA players, Eugenie Bouchard, Sloane Stephens and Laura Robson work their way up the rankings. Bouchard probably has the most solid game, Stephens the most mobile, and Robson the most powerful. They’ve all had good runs at the slams in the past year, but they still have some distance to go. Which brings me the champion of the women’s tournament. Na Li demonstrated what a dialed-in aggressive player can do. She was on target in her semifinal and final, and once she was ahead, she stayed ahead. They were pretty much as comprehensive as victories can get in the latter stages of a slam. Third time was the charm for her as well. She’s playing the most consistent tennis of her life in the past few months, but unfortunately she’s almost 32, so at best she has a couple of years to win a slam again. But who knows, if things line up, and she’s in form, she could take another crack at a trophy. Overall, not the most spectacular tournament in recent times; nonetheless it will be memorable because Stanislas Wawrinka put a large crack at the Big Four hegemony over the Grand Slam tournaments.